A Dozen Others Wouldn’t Be Half As Much Fun: For A Holiday Musical Second To None The Chance Theater’s “Anne Of Green Gables” Is The One! “Rest assured there’s plenty to make you smile here, and smile you certainly will–often suddenly or unexpectedly. 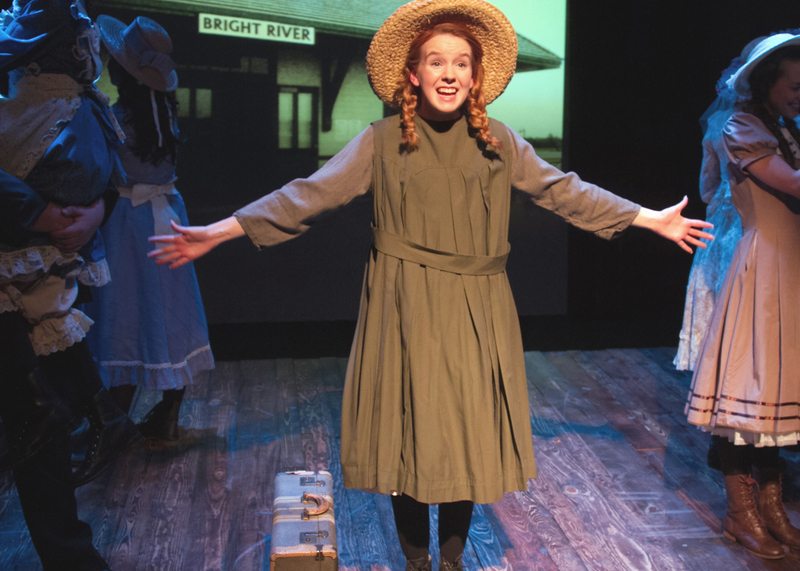 Indeed, given the gravity of recent headlines, The Chance Theater’s holiday musical ‘Anne Of Green Gables’ is just the thing to lift the spirit for two or so hours, transporting you back to far, far simpler–and in many ways, far, far pleasanter times. 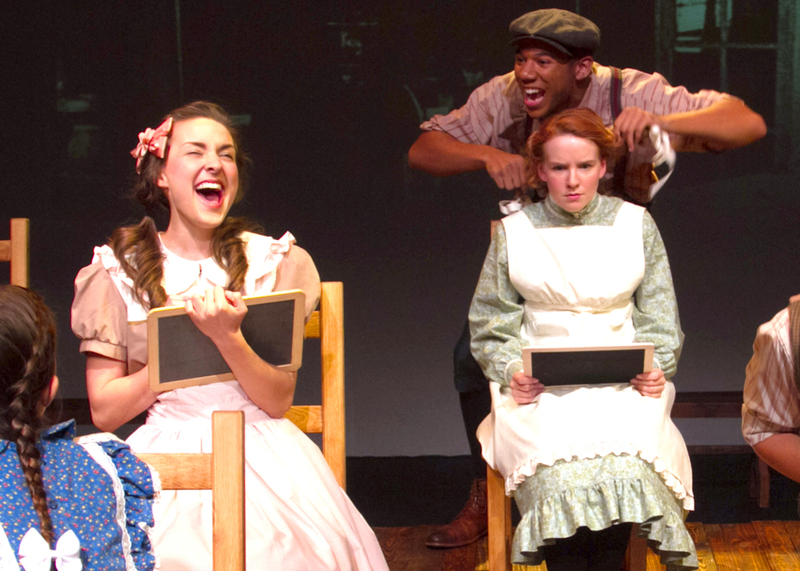 “Have you heard?” ‘The Chance Theater’, the award-winning “official resident theater company” of Anaheim California is brightening the holidays with an enchanting musical version of the classic “Anne of Green Gables”. Based on the 1908 novel by Lucy Maud Montgomery, the book is by Joseph Robinette (who also received a “Tony Award” nomination for his recent musical adaptation of “A Christmas Story”,) while the music and lyrics here are by Evelyn D. Swensson. Directed by “The Chance’s” own Managing Director, Casey Long with Associate Director Travis K. Donnelly, the musical direction is provided by Bill Strongin. 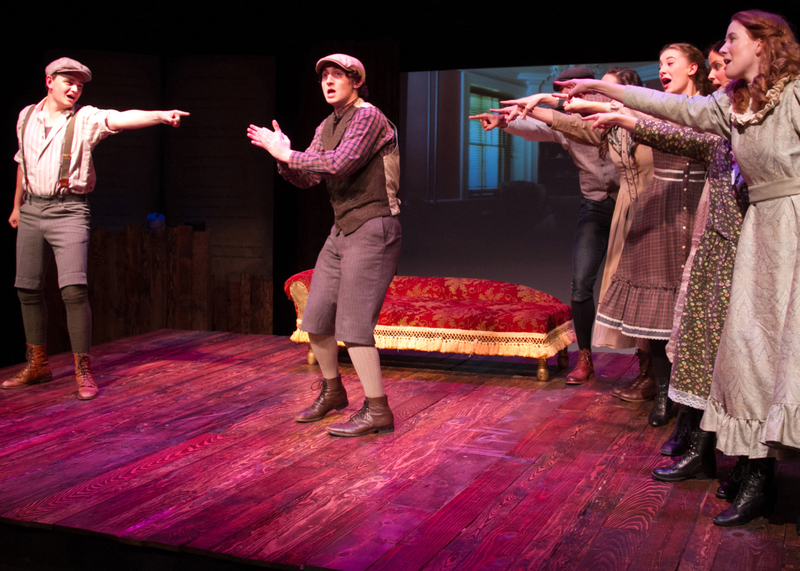 A charming and thoroughly heartwarming musical about a wholesome and humbler time and place, Robinette’s libretto is more vignette-oriented, but (thanks in no small part to Long’s astute and well-paced direction) it quietly draws you in. This effect is enhanced by Masako Tobaru’s vibrant “story-book’ set which literally allows the characters to leap from the page and onto center stage, supplemented by her equally clever lighting design which incorporates plenty of vintage photo projections that serve as a brilliant backdrop for which the scenes and numbers to play against (even the piano accompaniment is shrewdly camouflaged into the wood-work!) Likewise, Erika C. Miller’s authentic period costumes don’t ring a false note either. Long hailed by generations of readers young and old, the story opens when aging Brother and Sister “Matthew” and “Marilla Cuthbert” send for an orphan boy to help around their Prince Edward Island homestead; instead, they receive a red-haired, wide-eyed orphan girl named “Anne Shirley” (“But please call me ‘Cordelia’—I think ‘Cordelia’ is a much better name for me—don’t you think?” she initially suggests upon meeting them.) “Sounds like your imagination works overtime” Marilla frets, adding “I’m afraid you laugh and cry far too easily!” While Anne does have something of a penchant for getting into mischief, she’s definitely an irrepressible and very lovable gal, and over the course of her six years with them, she works her way, not only into the hearts of her new adoptive guardians, but also most all of the residents of the rural island’s town of “Avonlea”. The first “big” group number takes place on Anne’s first day at Sunday school in which the other kids (acting less than saintly,) divvy up with half singing the familiar hymn “Jesus Loves Me” even as the other half gossip about the new girl in town with “Have You Heard?” Then, our young heroine and her soon-to-be BFF, “Diana Barry” swear their undying loyalty, and in the process offer up some dynamic harmony in “The Pledge”, while the rest of the class again provide a terrific ‘counter obbligato’ singing “Amazing Grace”. Both numbers are an excellent example of the unique musical dexterity of Ms. Swensson’s score; although most of the original songs here tend to be kept short and sweet, she cleverly intertwines much of this new melodic material around such old standards and spirituals of the era including “School Days”, “Deck The Halls” (a rousing chorus of which serves as the Act Two opener,) “Shall We Gather By The River” (sung A Capella by the entire ensemble) and even “Pomp And Circumstance” (complete with seldom heard lyrics!) Through their inclusion, each of these established songs set the time while also effectively expanding the overall mood of what’s happening. Later, the show’s sole dance interlude is a nifty “cake-walk-inspired” outing called “The Charlotte-town Rag” as the students, frantically preparing for their final exams at “Queens Academy”, take a quick break to relax and shake off their stress. Looking as refined as a portraiture on a cameo brooch, Marina Coffee’s take on “Marilla” is exhilaratingly real and three-dimensional. It’s not that she’s cold or distant—far from it. She too progresses from a prim and proper spinster of her day not used to expressing strong emotions, to a warmer, more maternal woman who is the backbone of their little family. Her 11 O’clock benediction “My Little Girl” is gracefully delivered with enough genuinely touching sincerity to move you to tears. Corky Loupe also contributes exceptional support as her brother, “Matthew”, who right from the start has a soft spot in his heart for “Anne”. Moreover, Xavier J. Watson makes an impressive impression as “Gilbert Blythe”—the school boy who at the outset teases Anne about her “hair the color of carrots” (a particular sore-spot for the girl) but later develops into a man of great character, making a heroic sacrifice for Anne when she and Marilla need it most. “Has it ever occurred to you that we might possibly be friends?” he, obviously smitten, asks Anne in a conciliatory attempt. His titular ode to this ginger-haired lass whom he has a huge crush on allows Watson’s gold-medal quality voice to be heard to its rich and expressive best. “Disgracefully and shamefully DRUNK!” (–on ‘Raspberry Cordial’ aka ‘Currant Wine’!) Rachel Oliveros Catalano as “Mrs. 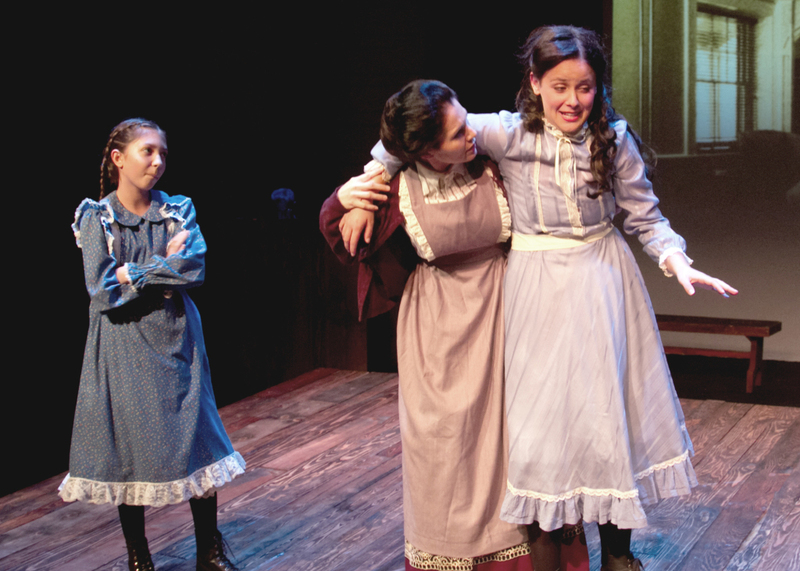 Barry” finds Nicole Schlitt as her daughter “Diana” not too steady on her feet while Abby Lutes as “Minnie May Barry” enjoys every minute of it. Most of the other ‘adults’ tackle several roles, like Sherry Domerego who provides some extra-large laughs, most notably as Marilla’s friend “Rachel Lynde”–the town busybody (“Why does Avonlea have a newspaper when it has Miss Rachel Lynde? 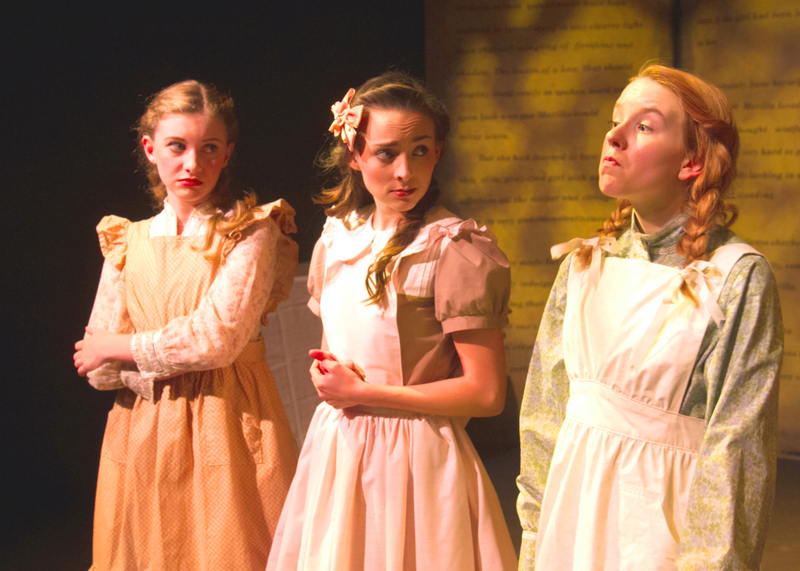 !” Anne queries upon learning she’s among the last in town to hear the buoyant news of her acing her exams.) Similarly seen in several parts is Rachel Oliveros Catalano, who also makes her presence felt from the kindly new schoolmarm who ignites Anne’s desire to attend “Queens Academy” (—a dream she would never would have dared hope for previously) to “Mrs. Allen”, the whinnying minister’s wife. In fact, Ms. Catalano appears so vastly different and well-drawn each time, it’s amazing to consider that these characters are portrayed by the same actress! 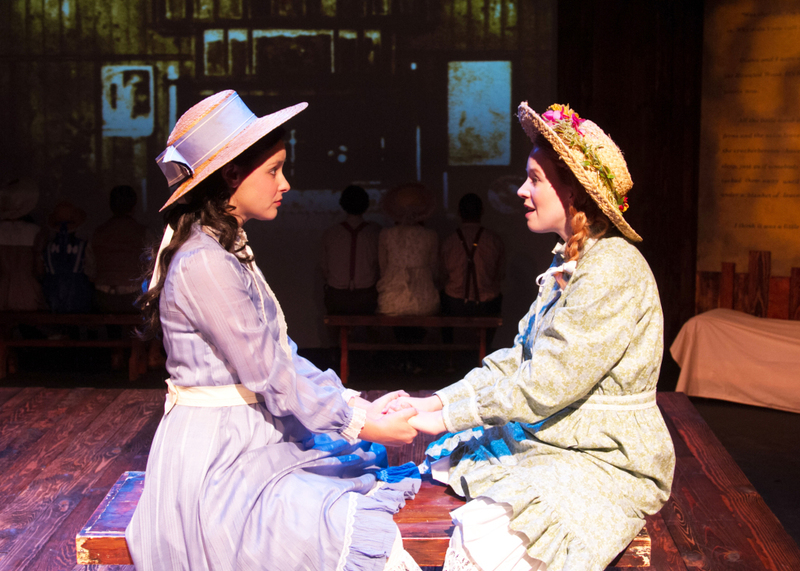 “Tho’ one would be less troublesome, she wouldn’t be half as fun–as Anne Of Green Gables!” Xavier J. Watson as “Gilbert Blythe” shows-off to get “Anne” (Angela Griswold’s) ‘attention’ with Emma Nossal as “Josie Pye” taking gleeful notice. Though the vivacious cast is peopled with plenty of delightfully diverse and idiosyncratic characters of all ages, shapes, and sizes, the entire show really centers around Angela Griswold’s performance as “Anne” (–that’s Anne with an “E”.) Happily, here she never disappoints–presenting “Miss Shirley” in a refreshingly natural depiction. Starting out, she’s appropriately starry-eyed and even a little rough around the edges, but throughout the second act especially, a fascinating transformation takes place as Anne, almost imperceptibly at first, “grows up”–so subtly that (as frequently happens in real life) you hardly notice until it’s already occurred. Her opening salvo “Green Gables”, wherein this newly arrived waif waits on the train platform dreaming of an ‘honest-to-goodness’ home to call her own, is affably and earnestly conveyed while “Kindred Spirits” is one of several beautifully vocalized duets sung opposite Nicole Schlitt as her pal “Diana”, that invigorates Act One. “Farewell My Friend” provides still another great opportunity for some dulcet (if all too brief) harmonizing from this talented pair as well. Rest assured there’s plenty to make you smile here, and smile you certainly will–often suddenly or unexpectedly. 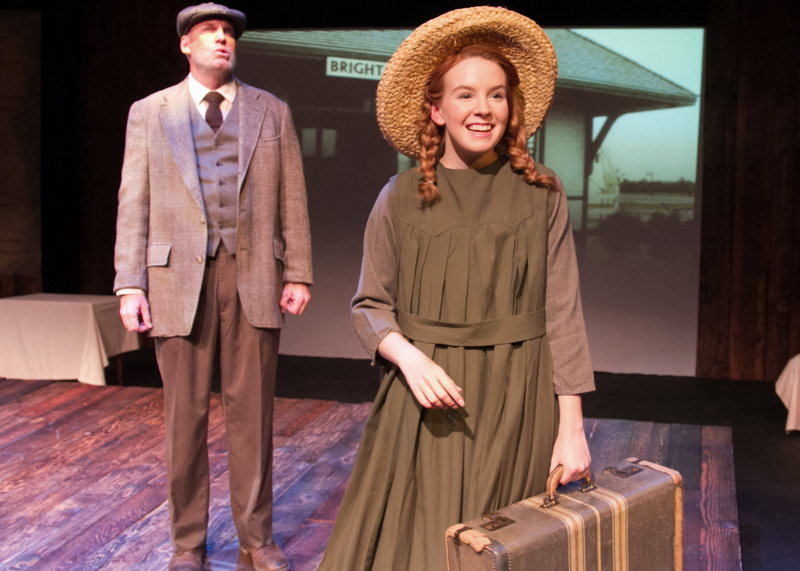 Indeed, given the gravity of recent headlines, The Chance Theater’s “Anne Of Green Gables” is just the thing to lift the spirit for two or so hours, transporting you back to far, far simpler–and in many ways, far more genteel times. 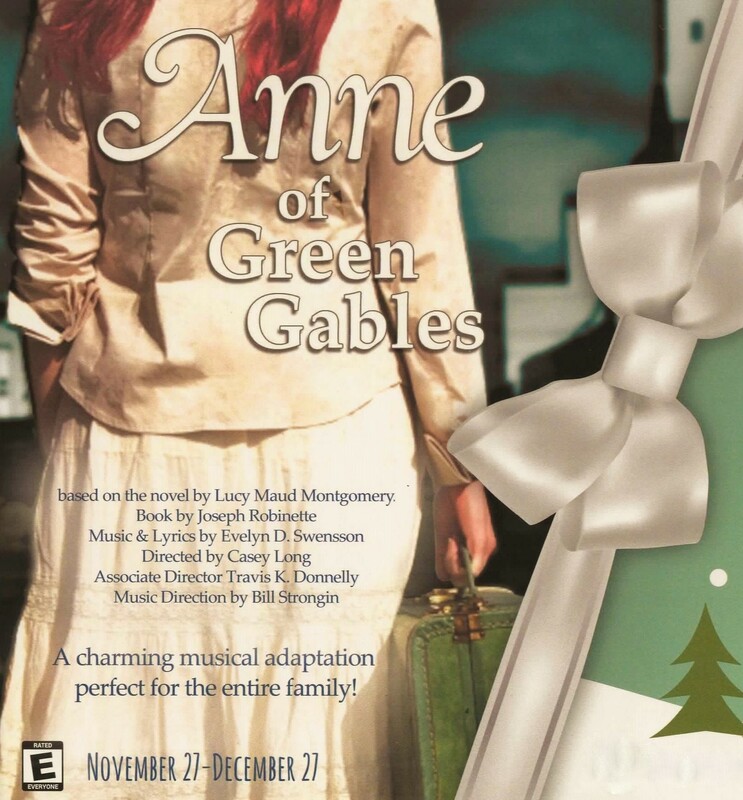 Having previewed from November 27th through December 3rd , “Anne Of Green Gables” officially opened on December 4th where it will continue to run through December 27th, 2015 at “The Chance Theater” @ “Bette Aitken Theater Arts Center” in Anaheim California, located at 5522 E. La Palma Avenue. Show-times are Fridays at 8:00 pm, Saturdays at 3:00 pm and 8:00 pm, with Sunday matinees at 2:00 pm. Although there will be no performance on Christmas (Friday, December 25th,) there will be a special added performance on Sunday, December 27th at 7:00 pm. Tickets may be obtained by calling the theater box-office at: (714) 777-3033, or on-line by logging onto: www.chancetheater.com ; For more information, check them out on face-book at: https://www.facebook.com/chancetheater . Production Photos By Doug Catiller At “True Image Studio” (www.trueimagestudio.com) Courtesy Of “The Chance Theater”; Special Thanks To Casey Long, Travis K. Donnelly, Bill Strongin, And To The Cast & Crew Of “The Chance Theater’s” “Anne Of Green Gables” For Making This Story Possible. 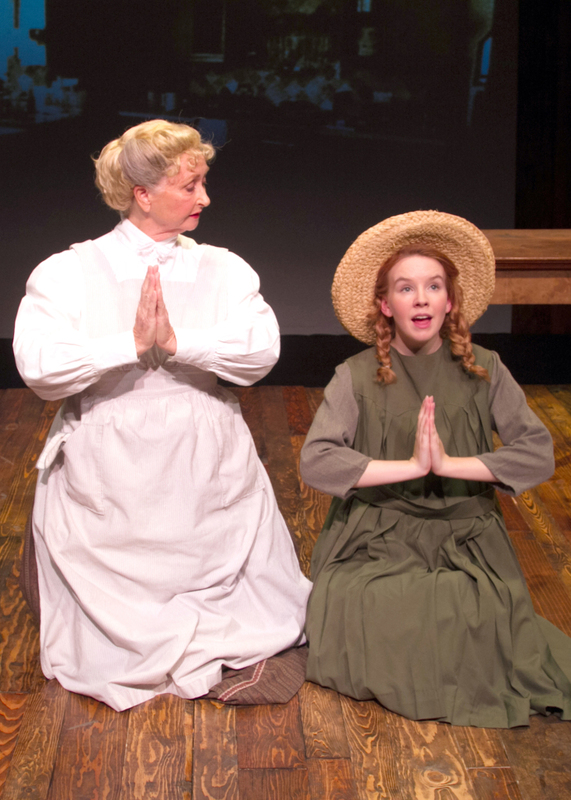 This entry was posted in Theater reviews and tagged "Anne Of Green Gables", 2015 Southern California Theater Season, Amazing Grace, Anaheim CA, Anaheim California, Anne Shirley, Avonlea, Classic 1908 Novels, Deck The Halls, Diana Barry, Evelyn D. Swensson, Family Musicals, Gilbert Blythe, Holiday Musicals, Joseph Robinette, Kindred Spirits, Lucy Maud Montgomery, Marilla Cuthbert, Matthew Cuthbert, Prince Edward Island, School Days, Shall We Gather By The River, The Bette Aiken Theater Arts Center, The Chance Theater. Bookmark the permalink.